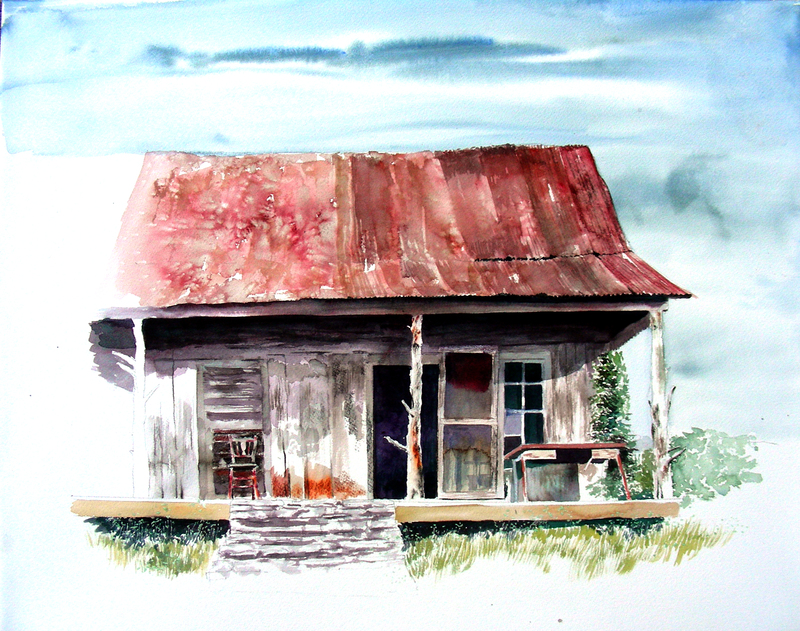 If you have been following my post, you may have read that I “froze up” on my first large painting of this historic cabin in Cotter, Arkansas. So, I began a second one, and once the juices began flowing, I went back to the original and finished it. Now I’ve decided to bring closure to this one (though it appears I won’t finish tonight, as much as I wish I could!). Right now, I’m up-to-my-elbows in it, and very interested. Today was quite a day. I rose shortly after sunrise, went to the historic Handley neighborhood and took some digital photos that I think will yield some good watercolor compositions. By the time 7:30 arrived, I decided to go on into downtown Fort Worth to see how Sundance Square looks in the low-angle morning sunlight. Choosing to avoid Loop 820 and Interstate 30, I chose to stay on Lancaster, finding it smooth sailing, relatively free of traffic, and conducive therefore for a speed trap. Yep. Ticketed for speeding. Once I got to Sundance Square, I found exquisite yellow sunlight all over the downtown architecture, and focused mostly on Haltom Jewelers, taking about 40 more photos from all angles. Then I settled into Starbuck’s on Sundance (hadn’t yet had my coffee-fix), opened Proust’s Remembrance of Things Past and found myself lost in a swoon. I cannot get enough of this guy! The more he spoke of primal sensations taking us back to childhood memories, the more I thought of the Cotter Cabin with its look, its smells, and its reminders of my parents’ roots in Southeast Missouri near the Mississippi River. The smell of the damp, rotting wood stuck in my throat, even though I was in modern upscale downtown Fort Worth. I didn’t want to leave. I don’t know how long I lingered there, reading, writing in my journal, and gazing across scores of years into my primal past. I couldn’t wait to get back to the house and resume this painting. So, yesterday it was William Carlos Williams with his Imagism. Today it was Proust and his “recollections” (Ha Ha–I call my company Recollections 54) as well as William Wordsworth and his “child is father to the man” mantra. It’s been a fabulous day, traffic ticket notwithstanding. Thanks for reading. Maybe I’ll finish this Cotter Cabin Deja Vu tomorrow. This small town physician drove from residence to residence throughout his working days, his eyes always taking in images that seemed to contain the stuff of revelation in them–a red wheelbarrow, shards from a broken green bottle, a housewife stooping outside her front door to pick up milk bottles–all of these images were recorded on prescription pads, and long after nightfall would grow into poems. For several years I have wanted to do with watercolor vignettes what Williams did with small poems–record objects that I take in during the day that strike some kind of chord of recognition from my past. So, with this current posting, I began by sorting through my plein air sketches from the past, and stopped with this tree top in my neighbor’s yard that I painted from my garage studio view early one morning. 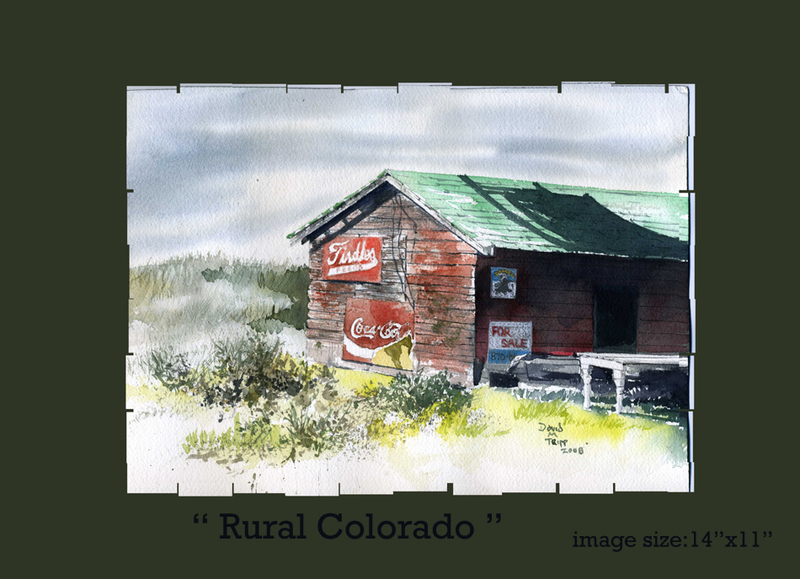 Turning to my digital library, I pulled up this pair of rural Colorado mailboxes that I photographed last summer as my wife and I stopped alongside the highway to admire a railroad bridge and the deep gorge cut between two mountain ranges. After photographing the bridge a dozen times, I turned and my attention immediately fastened on this pair of mailboxes. I probably looked like a stooge, shooting pictures of old mailboxes when all the natural beauty of the Colorado mountains lay sprawled before us. Twice in my life, I have lived in an isolated rural setting, and depended on a mailbox much like these to keep me in contact with the civilized world. In 1973, I worked for a summer at J. P. Coleman State Park near Iuka, Mississippi. The postmaster arranged for me to use an abandoned mailbox along one of the county roads, but it required a 3-mile walk for me to reach it from the interior of the State Park where I resided. I daily made that 3-mile walk. I was a college student on summer vacation and was blessed with a plethora of “writing” college friends that led to “something in the box” almost daily. In 1986 I lived in rural Whitesboro, Texas, on a Farm Market road seventeen miles out from the nearest city. Again, the mailbox kept me in touch with my remote friends and working associates. 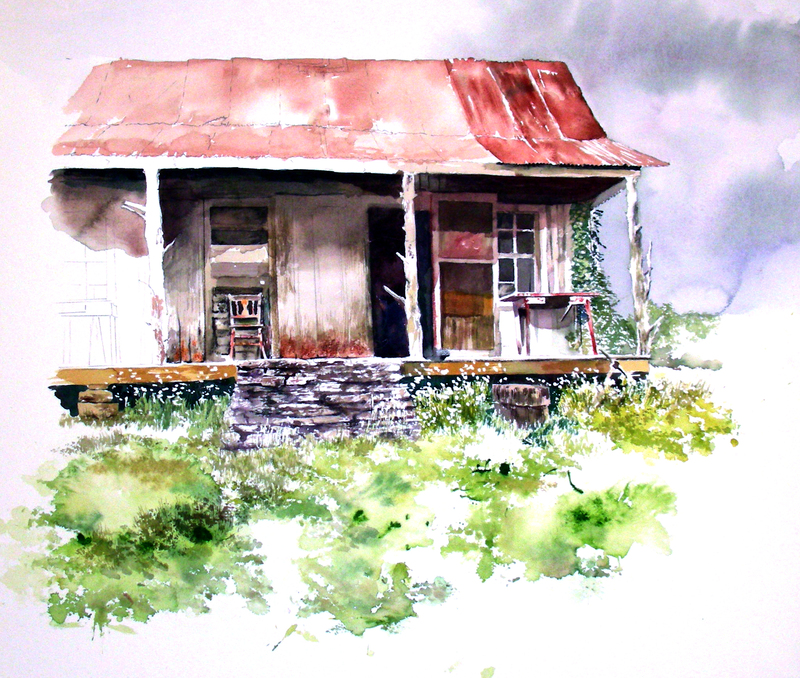 While living there, I spent many afternoons in the shade of the front porch, watching the mailbox down the dirt road and the approaching mail truck to see if the driver was going to stop. Letters, packages, anything left was a “connection” with my working world beyond the horizon. 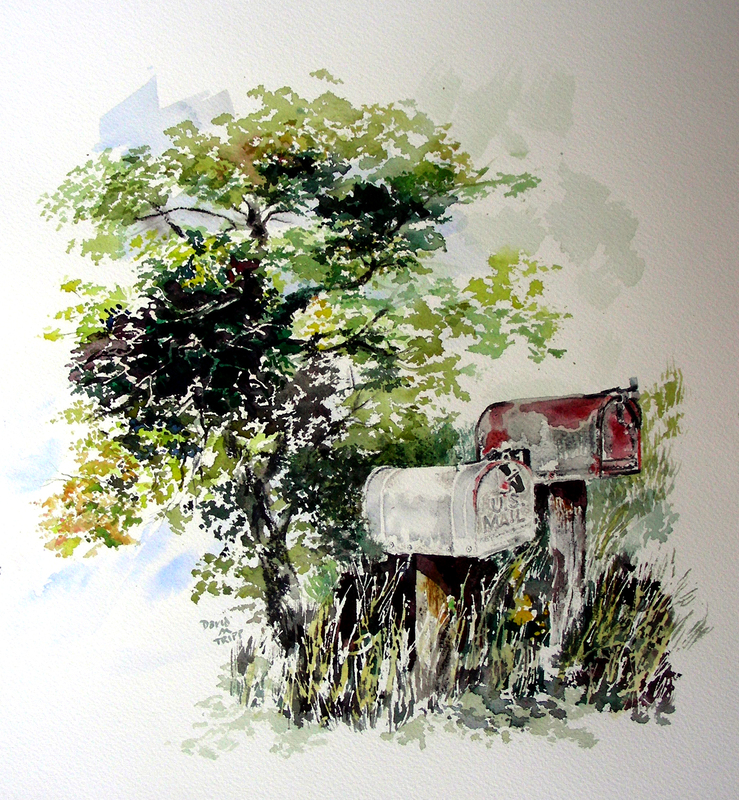 Although the sight of rural mailboxes has held my attention for years, it is only now that I pause to paint a pair. I’ve selected another photograph from my Arkansas odyssey of last year, and am considering a small watercolor sketch of that one as well. I’ve lost a few days of quality painting. Sometimes life takes a lousy turn, and mine is no exception. I’m glad I’m out of school for the summer, but hate to waste opportunities because I cannot seem to get myself back to work emotionally. Having said that, I did return to this one this afternoon, and have stayed rather steadily with it throughout the evening. I hope to finish it tomorrow, and truly celebrate Independence Day. I have a second watercolor of this same subject also in progress. I started it because this one was getting rather tight, and I was fumbling with my next move. 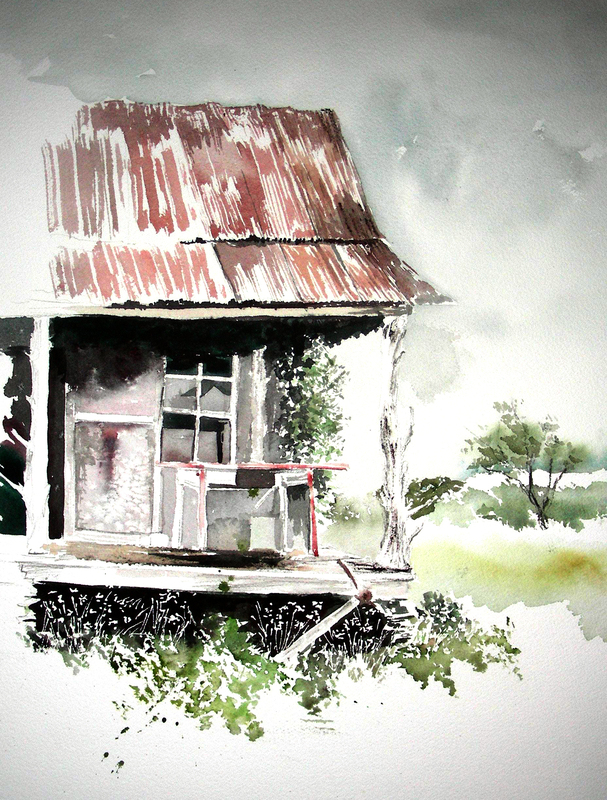 Then other personal things clouded my painting activities and both paintings got abandoned. At any rate, I’m resolved to work through the emotional baggage and get something creative accomplished. Perhaps I can finish this one tomorrow, and the other on the following day. I’ll try. I have other projects waiting in the wings and would like to move ahead with them. I’m happy with how the chair emerged in this work, and am getting more satisfied with the table. I found the stone steps an absolute delight to work with, thanks largely to the practice I got in a few weeks ago when I painted that limestone bluff in Eureka Springs. I had no idea that that activity would prove so helpful with this current painting. Now that the masking has been removed, the flowers are showing beneath the cabin, and out front as well. I’m seeing a few elements emerge that are beginning to please me with this painting. This was my second sublime morning of plein air painting during the Plein Air on the White River competition in Cotter, Arkansas. Shortly after the sun rose on this 1903 cabin, I found my eye filled with gratitude at every detail of this forsaken cabin that cried out for an Andrew Wyeth-style dry brush study. I only had about 90 minutes to work on it, but I am persuaded that I will give this subject some serious studio scrutiny in the immediate days ahead. These kinds of subjects are too elusive these days. I cannot find them very easily. Finally, back home, I am able to photograph my plein air paintings created during my stay at the Plein Air on the White River festival in Cotter, Arkansas. This was one of two wonderfully sublime mornings where I had the privilege of working all alone, surrounded by quiet, space, and feelings of the Sublime. What a wonderful world received me as I chipped away, attempting to record a profound experience en plein air. Finally got home before 9:00 p.m. Sunday night, exhausted. I promise much, much more concerning the Plein Air on the White River event. I have many, many photos, thanks to Bill Barksdale and my wife Sandi. I just haven’t the time tonight to get them all posted, as I have to rise at 5:30 a.m. and begin teaching school again tomorrow. This is a photo Bill took of me very early Saturday morning, as we studied this 1903 cabin, I believe to be the third home built in Cotter, Arkansas. The sun was just breaking through and the subject was filled with such a magnificent “presence” as I beheld it. I’ll have plenty more to add tomorrow. I promised to fill you in on the Emergency Room story. About 30 minutes after I finished judging the show and the awards were announced, I was visiting with two of the winning artists–Best of Show and Purchase Award winners. In the midst of our conversation under a tree, a fly or some kind of unidentified insect flew deep into my ear and commenced vibrating so loudly I thought my eardrum was going to explode. Never had I experienced such pain from a tiny insect. I could not dig it out, and 3-4 times it shrieked loudly from deep within my ear (I believe it was the wings beating) and the pain was excruciating. I was driven to the Emergency Room in Mountain Home (about a 30-minute drive as we had trouble finding the darned hospital), and got to go through all that process of checking in, waiting, examination, etc. Whatever the insect was, it was finally extracted as they flushed my ear with some kind of hot liquid, discovered an ear infection where the alien had been working, and gave me antibiotics and something with which to flush the ear daily. I was glad to know upon dismissal that whatever the assailant was, it was finally gone, my ear was clean, and there wasn’t going to be anything vile “hatching” somewhere between my inner ear and brain. A weird, weird event indeed, and I missed meeting all the artists, the wine, the cheese, the conversations–all the wonderful things that wrap up a show, I missed. Thanks for reading. More tomorrow . 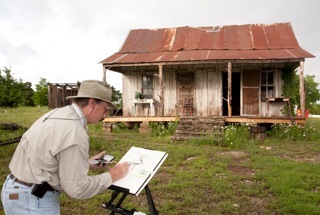 . .
Thursday, May 19, 2011, First Day of the Plein Air on the White River, Cotter, Arkansas. The first day is in the books. My eyelids are heavy, but I really wish to get this information on the blog. Yesterday, Sandi and I made the nine-hour drive from Arlington, Texas to Cotter, Arkansas to begin this event this morning at 8:00. 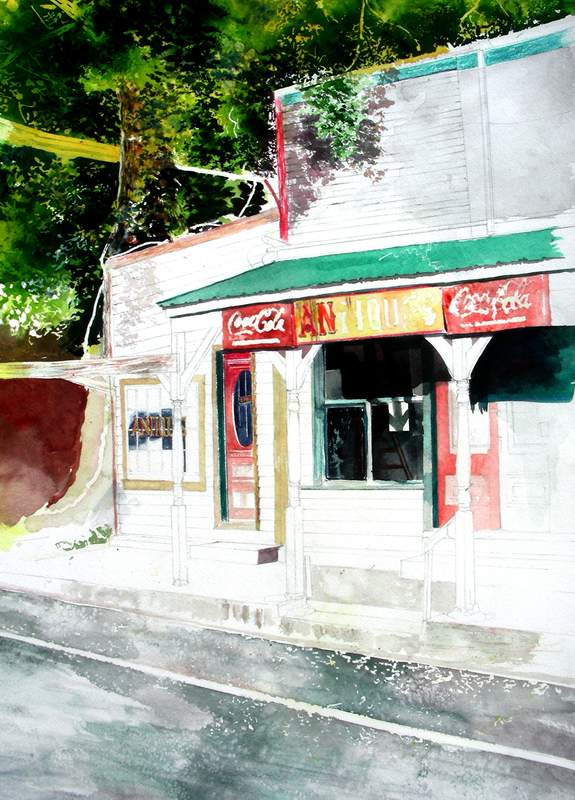 Twenty-seven artists registered today, and quickly dispersed throughout the thirty-mile designated radius of small Ozark Mountain towns in search of subjects to paint en plein air. It is my privilege this year to judge the competition, and I found it difficult to avoid seeing the artists’ paintings (I am supposed to judge the works without signatures and without prior knowledge of who painted what). It seemed that everywhere I turned throughout the day, there was an artist working at an easel! The town of Cotter was bathed in yellow sunlight throughout this afternoon, and I think I felt some of that joy that Winslow Homer knew in 1878 when he figured it out that transparent watercolor offers a magnificent way of experiencing the effects of light shimmering off the white paper as it glows through the washes of transparent watercolor. This afternoon I was privileged to experience the excitement of layering washes of transparent color and experiencing the changes in light that appeared through the layers from the paper surface beneath. I cannot wait to get in on this some more tomorrow. I have quite a few experimental ideas percolating this night. 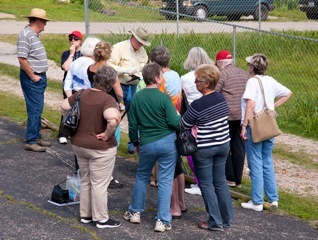 My only responsibility today was to present a 3:00 demonstration of the plein air process in watercolor. I chose this house built around 1914, today known as the Billingsley House. 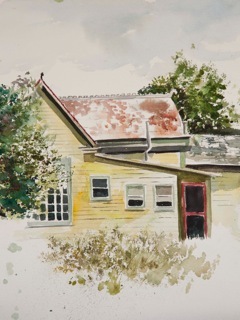 As I looked across the backyard and attempted to paint what I saw, and enjoyed the participating artists gathered to watch the demonstration, I could not help but wonder what kind of personal history this property carried with it. I was to find out later that evening. Mrs. Billingsley lived alone in this house during the 1950’s and the story is that she would stand inside her fenced-in yard and visit with students walking by on their way to school. She would walk the entire property, talking with the children all the way to her furthest boundary, and continue talking as they journeyed further and further away, en route to the school house. No doubt much of what they were learning from textbooks contained a diminished value compared to what she had lived, witnessed and was willing to share to anyone who would listen. Cotter was launched with the coming of the railroad around 1902 and the erection of a lumber company between 1903 and 1904. With the lumber company came the construction of the most famous landmark houses of this small town, now with a population slightly under 1,000. Hopefully I will be able to recover some lost sleep tonight and put in a productive day of painting tomorrow. I already look forward to posting more tomorrow evening when the day is done. I am starting to repair some of the bad beginnings to this painting. 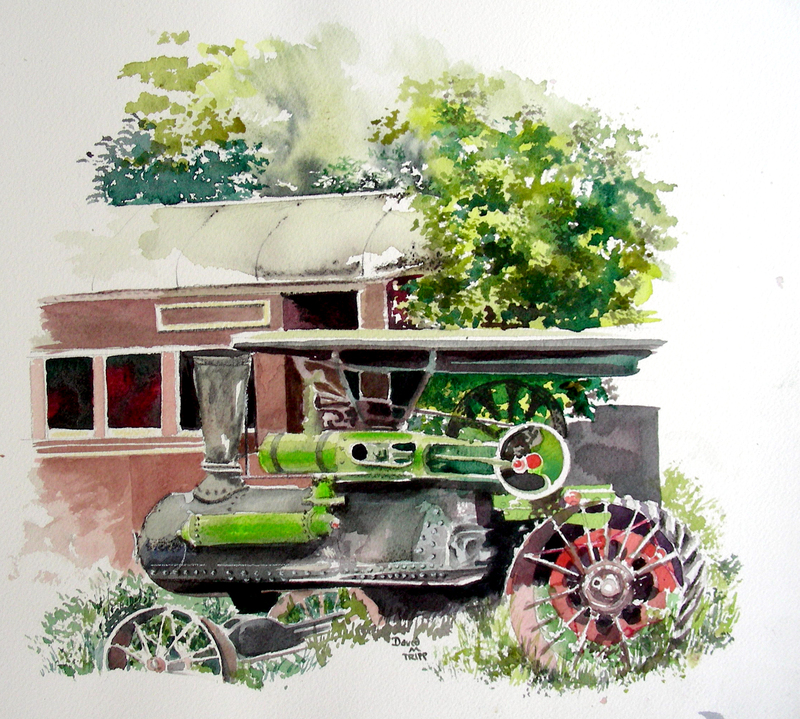 It started out as a poured watercolor, and much of the pouring of the foliage in the background got away from me. Thanks to the brush, and some patience, the foliage is starting to look a little better. I had also exerted considerable clumsiness in rendering this store facade in pencil. Today, thanks to the eraser and a good triangle, I “re-plumbed” the structure and now it actually appears to be standing upright as it should. Some of the faulty perspective lines of the siding have also been repaired. The building looks more “correct” now. I had the rare privilege of spending the good part of today in my studio. The past week of school was vomitous, with state-mandated tests taking up all the mornings, and then entire “regular” day scheduled classes crushed into the afternoon hours–felt like 15-hour workdays and I came home every evening exhausted and disgusted. Glad that is behind me now. Today was a much better day. Winfield, Missouri is a sleepy Mississippi River town on Highway 79 northwest of St. Louis. I traveled this road frequently during my university years as the highway connected my home with my campus five hours away. Two summers ago, while on vacation, I decided to follow this old river highway once more to see if there were any sites worth capturing in watercolor. I passed this establishment just as the sun was coming up. 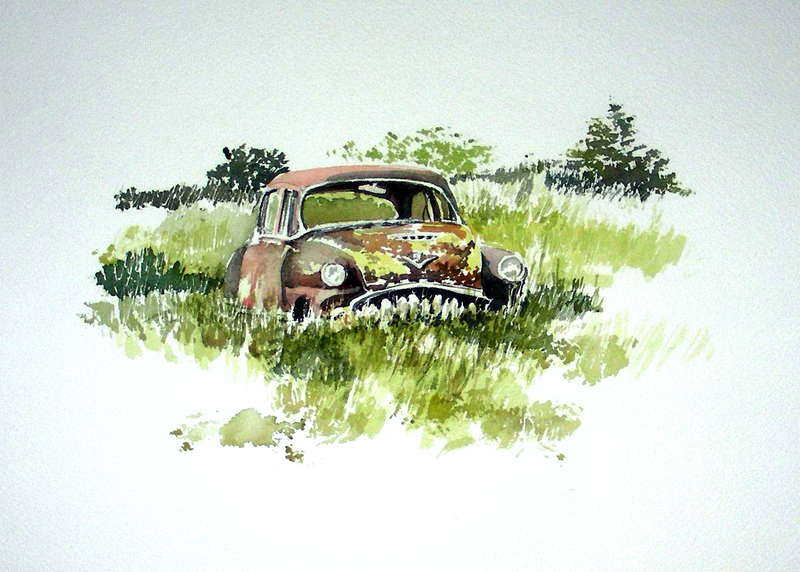 I have already painted it twice (smaller compositions that you can see on my website http://www.recollections54.com) but now have decided to go for some size and detail. Same old tired story–school responsibilities have taken me out of the studio the past two days, and resultantly, this blog died. But it is Friday morning, and in just a few hours, I will escape to the garage/studio and get something else going (not sure exactly what, but will indeed pick up the brush and resume the enterprise). I will be posting something this evening to give an account of today’s art endeavors.